servant leadership. It's all about putting other people first." Ken Blanchard is one of the most influential leadership experts in the world. He is coauthor of the iconic bestseller The New One Minute Manager® and more than sixty other books that have combined sales of more than twenty-one million copies in forty-two languages. In 2005 he was inducted into Amazon's Hall of Fame as one of the top twenty-five bestselling authors of all time. Ken is cofounder with his wife, Margie, of The Ken Blanchard Companies®, a leading international training and consulting firm. 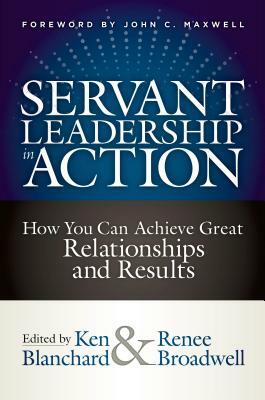 In addition to being a renowned speaker and consultant, Ken is also cofounder of Lead Like Jesus, a global ministry dedicated to helping people become servant leaders. Renee Broadwell has been an editor with The Ken Blanchard Companies for more than ten years, working directly with Ken as lead editor on several book projects including Lead with LUV, Legendary Service, Fit at Last, Collaboration Begins with You, Lead Like Jesus Revisited, and The Simple Truths of Service. She also serves as editor on articles, blogs, other social media, and special projects, partnering with various Blanchard departments including Communications, Marketing, and the executive suite.